Achieving the financial future you want is no different than a successful construction project. You need the proper plan and tools to do the job right. When you hire us,we have the construction accounting services to help you reach your short term, and more importantly, your long-term goals. If your hard work is not reflected in your profit our monthly bookkeeping services can keep track of your finances. If your net income is not where it should be, it may be becausecosts are not tracked through bookkeeping. Monthly financials with a detailed breakdown of costs can result in significant savings on taxes, payroll, or other expenses. 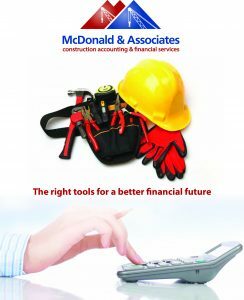 At McDonald & Associates, we know that working with construction clients means more than simply providing accounting and tax services. It means having an in-depth understanding of the complexities involved with the financial management of construction companies. As the construction financial experts, we can relieve you of the burden of doing your taxes, payroll, and accounting – while you focus on running your business. Many of our construction clients using QuickBooks TM have discovered the difficulty of accurately costing jobs. As QuickBooks TM Pro Advisors, we can help set up job costing to accurately track costs by job, which will result in higher profit margins. As tax experts, we can assist with tax planning to assure you receive the tax credits for being an energy efficient residential home builder. We help take the confusion out of being compliant with tax laws, including out-of-state payroll, unemployment taxes, highway use, county and local taxes. We know you have a complex business with various pay rates and job classifications. Our team has the knowledge to meet these challenges through active payroll processing. Workers’ Compensation is critical to contractors. We have the experience to reduce costs by differentiating job classifications and conducting the Workers’ Compensation Audit for you. The downsized economy has been difficult for the construction market. We meet with clients on a regular basis to review job costing, profit and loss statements, and address concerns. Planning for your future often involves a succession plan. We have helped several construction clients develop a plan to pass their business on to their family, a valued employee or as an employee-owned company. When you work with McDonald & Associates, our goal is to provide efficient and responsive service. If you are working with an in-house person or an accounting firm, we can make the transition to our services seamless. When you have questions, you can count on our team for a response from us within 24 hours. Check out our construction accounting brochure for more information! Please contact me about your construction accounting and financial services. Let us know your email address, to receive the latest news and information. Thank you for your interest in McDonald and Associates and our serves. Please complete the form and we will contact you soon about your project. We have been serving Michigan with professional, affordable, and personal accounting services. Our focus is delivering maximum value while we work to maximizie your wealth.